Hurricane season isn't over until November 30, so there's almost certainly more to come. First came Harvey, which dumped unprecedented amounts of rain on Houston and the Gulf Coast. Then Irma rolled over the Virgin Islands, St. Martin, and other parts of the Caribbean before slamming into Florida. Maria stripped the roofs off of building after building in Dominica and wiped out the power infrastructure in Puerto Rico. Two of those storms first made landfall as Category 5 hurricanes, the other a Category 4. And those are just the major hurricanes (defined as Category 3 or above) of 2017 that have made landfall. Another major hurricane, Jose, threatened some already ravaged Caribbean islands before taking a turn to to the north. So far this year, there have been seven hurricanes in total, and 13 named storms. If those numbers make the 2017 hurricane season seem particularly intense, that’s because it is. The National Oceanic and Atmospheric Organization has a formal definition for an “extremely active” Atlantic hurricane season. For that to happen, storms have to generate a certain amount of accumulated cyclone energy — a measure of storm intensity, duration, and frequency. There also have to meet two out of these three conditions: 13 or more named storms, 7 or more hurricanes, and 3 or more major hurricanes. Phil Klotzbach, a meteorologist at Colorado State University, specializes in Atlantic hurricane forecasts and tracks cyclone energy. He said on Twitter that by September 20, we’d already met the definition of “extremely active,” with enough cyclone energy and all three of the above conditions checked off. Hurricane season isn’t over until November 30, so there’s almost certainly more to come. So why do storms keep coming one after another? In many ways, 2017 has had ideal conditions for a lot of big, powerful storms, several experts told Business Insider. Two main factors have allowed these massive storms to form: the lack of an El Niño system, and the fact that the Atlantic is unusually warm. El Niño systems generate particularly warm temperatures in the Pacific, which tends to create high wind shear in the Atlantic. James Belanger, a senior meteorological scientist with The Weather Company (the group behind the Weather Channel and Weather Underground), told Business Insider that wind shear “rips storms apart” before they develop into massive systems. But this year, we’ve had what are referred to as “ENSO-neutral” conditions so far, meaning that there hasn’t been any El Niño or La Niña system whose wind shear could prevent hurricanes. Warm ocean temperatures in the Caribbean allowed this year’s storms to rapidly gain power. Maria, the most recent, is likely to set a record for being the most rapidly intensifying hurricane ever measured. Two combined factors affect on Atlantic temperatures: ocean heat content (a measure of heat stored by the ocean), and sea surface temperatures (measured at the top layer of the ocean). There’s no simple explanation for this year’s high surface temperatures and ocean heat content, according to Belanger. One possibility is that weaker trade winds and wind speeds in the Atlantic have led to less evaporation, which would normally cool the ocean more. Another factor is climate change, since data indicates that a warmer climate is likely to result in more intense hurricanes and more rapid storm intensification. Oceans absorb much of the heat that’s emitted into the atmosphere, which leads to warmer water. That’s one of the reasons researchers say that climate change will lead to more intense storms like the ones we’ve seen this year. Along with raising sea temperatures, climate change also causes sea-level rise — which makes cities more vulnerable to the storm surge that comes with hurricanes. Plus, global warming is expected to lead to a higher concentration of atmospheric water vapor and heavier rainfall. Intense rainfall can be devastating, as Harvey showed in Houston and Maria has shown in Puerto Rico. 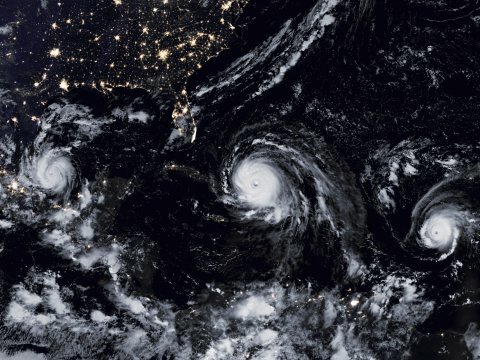 Climate change didn’t cause any of the storms that we’ve seen this year, and we don’t yet know how the changing climate affected these specific hurricanes. But climate scientists have warned that the world could see more storms as temperatures rise. If nothing else, this season could serve as an example of what we’ll see in the future. Yet another explanation for the warmer Atlantic Ocean could be changes in high and low pressure systems that caused surface temperatures to fluctuate, according to Michael Ventrice, a meteorological scientist at The Weather Company. Ventrice said a current called the Atlantic Multi-decadal Oscillation (AMO) may also have played a role — that current is slow moving, and changes conditions on a 20 to 50 year scale. At the start of the 2017 season, meteorologists were unsure whether the AMO was still in a warm phase, according to NOAA. But if so, that could help explain this season’s activity as well. Whatever the reason for 2017’s seemingly endless bombardment of hurricanes, we have certainly seen records get broken this year. This is the first time in known history that the Atlantic has had two storms with 150+ mph winds raging at the same time: Irma and Jose. 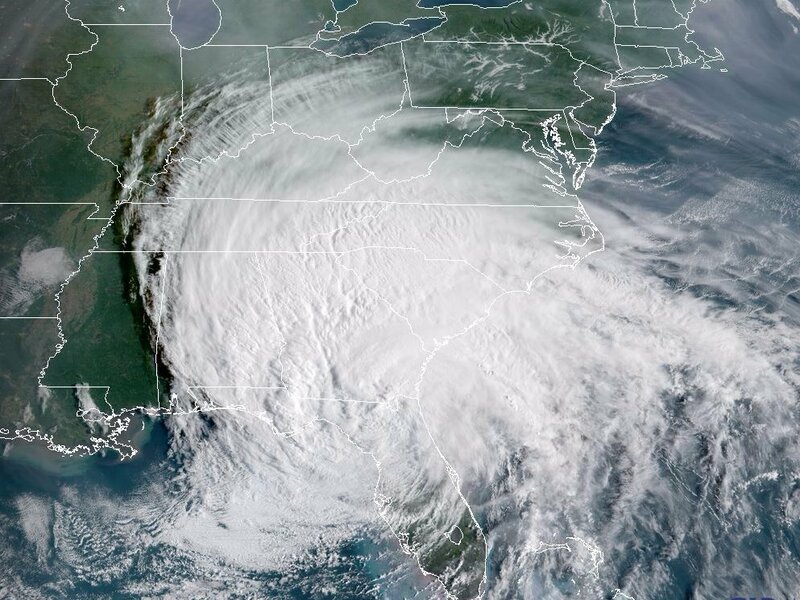 Maria went from a tropical depression to a Category 5 storm in two-and-a-half days, a speed that Mark DeMaria, acting deputy director of the National Hurricane Center, told the Washington Post is most likely the record for fastest intensification in the Atlantic. This year we could also very likely set a record for cyclone energy generated in September, according to Phil Klotzbach. But this season isn’t the worst we’ve ever seen, as much as it might seem that way. That distinction belongs to 2005. That year, there were so many named storms that we ran through the whole alphabetical list of names (the letters Q, U, X, Y, and Z are not used) and then had to run through the Greek alphabet, using Alpha, Beta, Gamma, Delta, Epsilon, and Zeta. Fifteen storms in 2005 were hurricanes, with seven being major hurricanes. Five storm names were retired that year because of the devastation the hurricanes caused: Dennis, Katrina, Rita, Stan, and Wilma. We will most likely have at least three names retired after 2017: Harvey, Irma, and Maria. Based on the Atlantic hurricane activity so far this year, we’re not quite on pace to surpass 2005. But as Molly Rubin recently wrote in Quartz, if you look at both the Atlantic and Pacific simultaneously, the world is on pace for a new record number of named storms overall, outpacing 2012 and 2005. After Maria dissipates, we’re likely to enter a quieter period in the Atlantic, according to Dr. Jeff Masters of Weather Underground. But there’s still reason to watch for new storms developing in the Caribbean, since water temperatures remain warm. And even if we have a quiet week or two, there’s plenty more time for storms to come. Hurricane season peaks on September 10, but the period of peak activity lasts though the middle of October. The season isn’t over until November 30.